This blog has been pretty single-sided. Val has done all the posting to this point. I figured I had to chime in here. I'm not a very verbose individual so I'm not sure how I got so long-winded here. 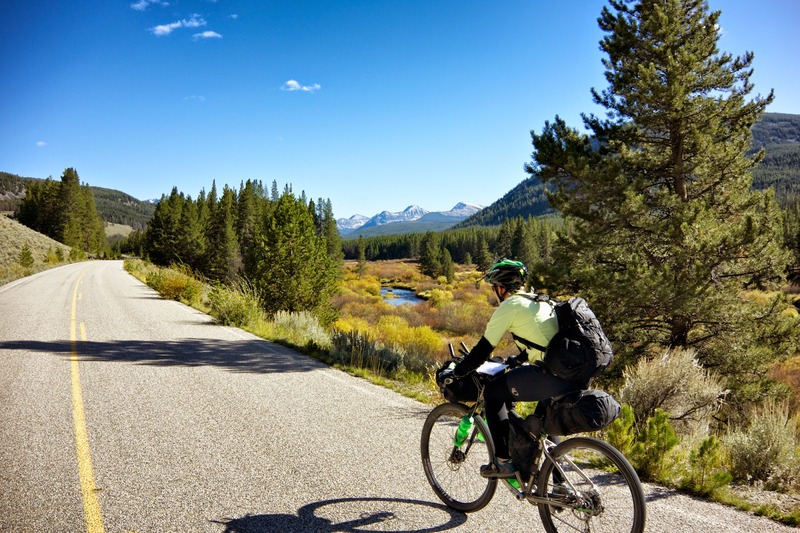 The Tour Divide 2015... Yup, I'm in. After a fabulously wonderful fail in 2014 I've got it in my atrophying brain to give this race another go. Val, my wife, finished in 2014. I was able to be in Antelope Wells as she rolled across the finish. An amazing accomplishment! So happy for her and filled with just a touch of envy. I was afraid she would hold it over my head for years: "Hey remember when I finished the Tour Divide and you didn't?" A sentence I seem to hear in my head when my disappointment overwhelms me. I hear it often. She never has and never would say those words but they sure ring loud and clear in my ears. How did I get here and why do I want another go at it? I'm not much of a bike racer. 25 years ago I had mild success in a small handful of races before pursuing other passions, school and a job. My bikes laid around mostly as conversation pieces for a few decades. Luckily, my wife got me riding again about 5 years ago. 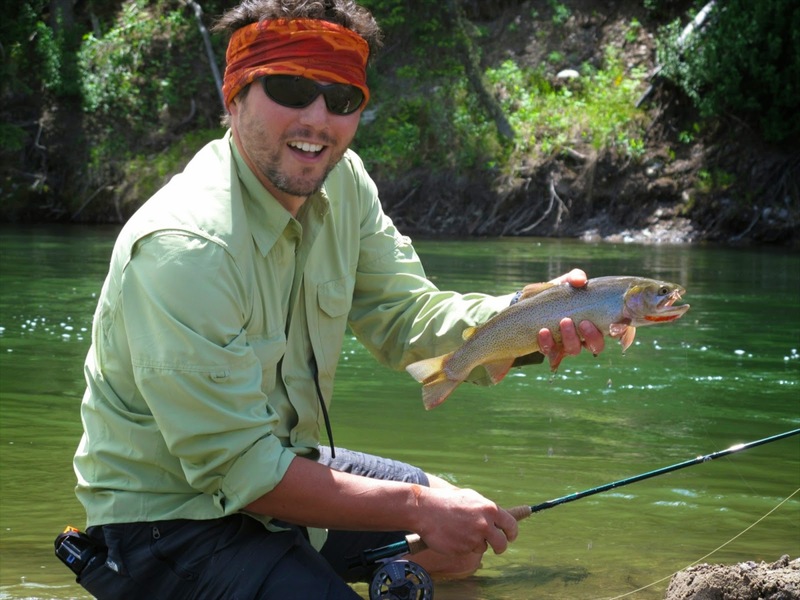 I was quickly approaching 40 and gaining the beer gut of a consummate fly fisherman. She pushed me to purchase a new bike for my 35th birthday so we could tour together. She had a lovely Salsa Vaya so I set about finding a comparable bike to get out there with her. I got a Salsa Fargo. It rekindled my love with the ride. Go anywhere and go far. I began riding more and more. 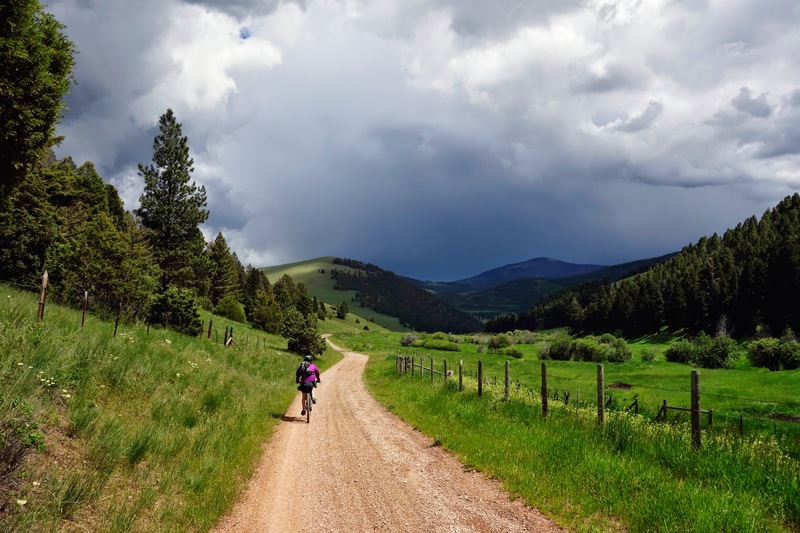 My obsession of riding any and every back road quickly led me to finding out about the Tour Divide. I read on Salsa Cycle's website of Joe Meiser racing the Divide in 2009. I followed that race online as best I could and began to cobble together the requisite information to determine that this might be my ultimate challenge. A race against a course, point A to point B as fast as you can. No prizes, no real glory. Do it self-supported. Just a small group of like minded folks out challenging something grand. The mountain bike and road bike racing scene stopped appealing to me in my early 20s probably because things had gotten so commercial, expensive and cheating was everywhere but this "race" garnered my attention like no other. Heck, you just get on your bike and ride your heart out. If someone cheats, then so be it. If you finish legit then you know it and that is something you will always have. For 4 years I rode with one goal in mind. To finish the Tour Divide as fast as I could. A speed which I really wasn't sure would compete with the front runners. In fact, I had many thoughts of not racing as I wasn't sure I could finish within the recommended competitive finish time of 1.5 times the record or around 25 days. 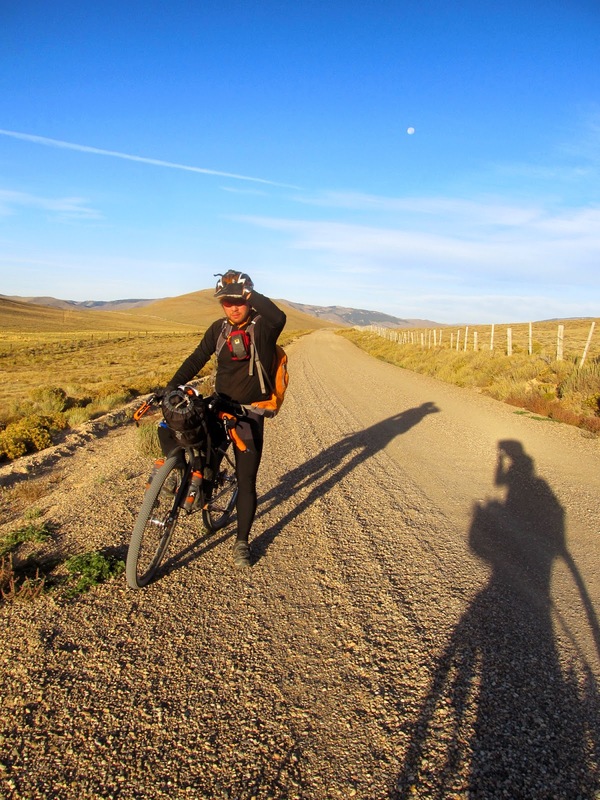 By the time Ride the Divide the movie was out and popularized amongst bikepackers I really wondered if it was something I wanted to do. The start field was growing every year and it was looking like the Divide was headed for some drastic changes in the spirit of the event. There looms the question as to what are the intentions of many "racers". Have we gotten away from the solo aspect of the event? Are the racers creating their own rules en route? Should most of the beginners be touring it instead? And what is the purpose of trying to cheat in a challenge such as this? Indeed, in 2014 we saw many a beginner of the TD take alternating courses from the approved route and not disqualify themselves. Many people purposely rode together, shared supplies and so on. The rules of the Divide actually seem quite simple. Beautifully simple! It's a shame that the last few years have seen page after page of forum filled up with discussions related to this dilemma. 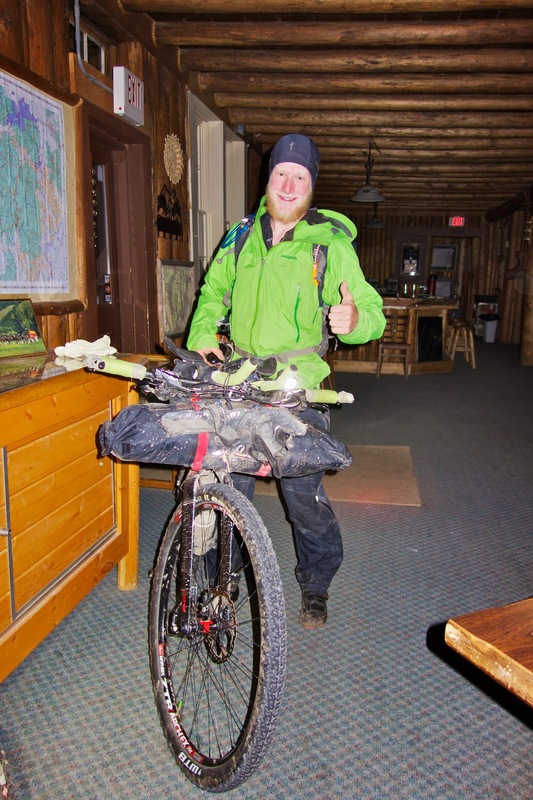 It was refreshing to find out that our Tour Divide Grand Poo bah, Matthew, still has a guiding light that shines brightly on the true spirit of the challenge. In many ways this race is truly what you make it. I just wonder if many of those that line up for the Grand Depart would be better off, and have more fun, challenging the course as a tour with some good buddies. After all, this is a race of sorts. The rules are out there and again, they are quite simple. Nonetheless, I was able to get into a fitness level that I thought would allow me to finish within a competitive time as outlined in the TD rules. I forwent most of my other obsessions for the single goal of finishing the TD in less than 21 days. Somehow, along with the generosity of some co-workers, I finagled time off from work in 2014 to give it a go. 2014 would be my year. I would actually be able to line up in Banff on Friday the 13th of June to compete in The Tour Divide. I had a marvelous race. Well, for two and a half days at least. After riding much stronger than I thought I would for those first 48 hours, in heinous weather, I decided that day 3 would be when I started "racing". Besides, Canada is just supposed to be a prologue right? That prologue was SOME ride. Cold, wet, cold, wet, wet, COLD! Despite the torture chamber of wetness and cold I had a blast. I was truly having fun and was happy as a fellow can be. Maybe I was being fueled by exceeding my expectations in the ride to this point. I was cruising at my lightweight touring pace through Canada and felt awesome. Somehow this pace was good enough to get amongst the front runners. More of a chase group I suppose as Jefe was already off-the-front. I remember rolling into Bolton Creek Trading Post and seeing Joe Polk from MTB Cast. We chatted for a moment and he told me I was in 4th place at that point. I was shocked and almost got a beer at the store so I could slow down a bit. But I felt good. Really good and I wanted to finish this thing as fast as I could. I wanted there to be no doubt in my mind that I was going to go from point A to point B as fast as I was capable of. Of course it was only day 2. It was at the Bolton Creek Trading Post that I first met Calvin Decker who was in 3rd place at that moment early in the Divide. Calvin would later go on to finish 2nd overall. Way to go Calvin! He and I would share a hotel room twice during my abbreviated TD effort. Calvin is an awesome fellow and one I was happy to share my short TD effort with. There is an easy sort of kinship between most Divide riders. I suppose these brief interactions amongst kindred spirits may be one of the finest aspects of participating in the Grand Depart. Calvin, in particular, seemed to understand the spirit of the Divide in a way that aligned deeply with my thoughts. I considered him a good friend during my brief time out there. The evening of day 2 found me in Eureka. Having rolled into Eureka in the top ten or so I was able to procure a private room which provided me time to soak in a bathtub and thaw while eating 12 pieces of fried chicken and drinking about a gallon of orange juice followed by a couple of donuts. Ahh, Divide food. I also needed the soak to rinse off my backside. I made the momentous error of applying chamois cream midday in the Flathead valley. Seemed like a good idea except for the coating of decomposed granite sand that was on every part of my exterior clothing. There really is no way to apply cream to your privates without also applying sand. Ouch! Early the next morning I left Eureka in somewhere around 10th place, at least from what I could determine. My online activity during the race was very limited. Some racers manage to seemingly be connected all the time and ride really fast to boot. That is a rare form of talent. Climbing up the Whitefish Divide out of Eureka was an awesome morning for me. Early in that day I was able to pass many riders that started earlier in the morning than me. There was the Tandem of Sam and Katie (An awesome couple), Evan Deutsch (whom I would later cross over Richmond Peak with), Ryan Lee, and several others including a Swiss and German whose names escape me now. All riders I viewed as being very strong. I was cruising. The Flathead valley near Polebridge flew by. My ride and hike through the snow up to Red Meadow Lake was smooth. I felt unstoppable. Red Meadow Pass was maybe 5 miles of snow hike-a-bike. I was jogging slowly with my bike through most of it. I just wanted to go FAST! I wanted to make my goal of doing this thing as fast as I could. The descent to Whitefish from Red Meadow was broken snow and mud near the top. I'd ride the mud, dismount and run through the snow. Ride mud, dismount, hoof it over snow and repeat. Fun times! Near the last bit of visible snow over the road I decided that it was thin enough to ride. I was barreling through the mud and hit the snow,no problem other than a bit of shimmy. I exited the snow back into the mud and my front wheel sank. Hard and deep. My bike was endoing. I was clipped in and going vertical. Naturally, I attempted to make some form of maneuver while in the air to correct myself. I was trying to stick the landing like Danny Macaskill, however I think I resembled a portly Thanksgiving turkey going through a Crazy Straw. The end result of my front wheelie dancing was me crashing to the ground, left leg first, followed by a pile drive of a loaded bike. If I had only augured into the mud, I likely would have been fine. Instead, the landing pad for my leg was a lovely bowling ball of granite and tree branch washed down to the road via an avalanche. I quickly gathered myself, clicked in and rode on. As I turned the pedals I realized something was wrong. What that something was I wouldn't really find out for another 700ish miles. 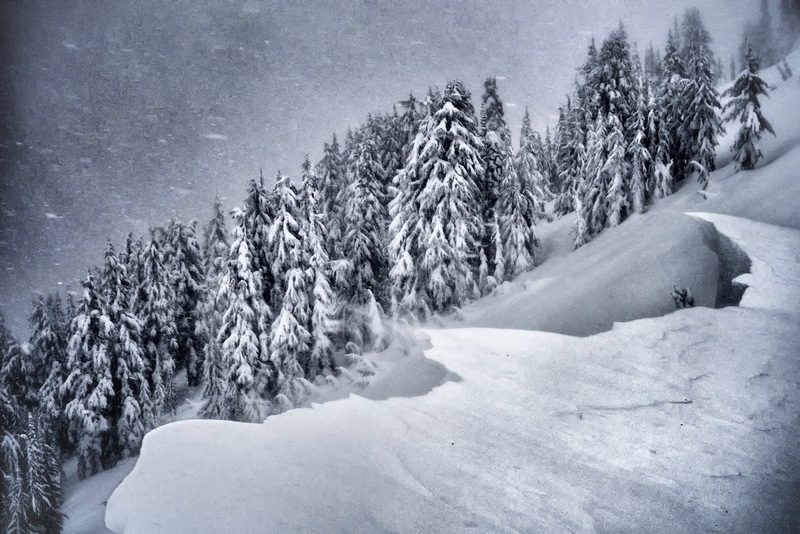 Shortly after the wreck I passed by a photographer standing in the debris of a large avalanche. Turns out it was Tandem racer Sam's brother, Peter Newbury. I still remember trying to walk through the debris pile nonchalantly as his off-camera flashes flickered away. I wanted to look good, strong and unstoppable. I almost broke down and asked him for a ride out of there. I resisted this urge and painfully clicked back in again. The pain of clicking in and out was the worst. Lifting my left leg back onto the pedal after stopping just didn't feel right. Pedaling was agony but doable for the most part but the upstroke felt horrible. I stopped on the outskirts of Whitefish at a gas station for some fried goodness. Limping around and covered in mud the store attendants eyed me suspiciously. I looked like a down and out gold miner or maybe a meth addict in need of a fix. Wet, shaking, limping and dirty. Getting that left leg onto the bike was almost too much. My own assessment at that moment was that I had severely contused my left knee and lower leg. I figured it should get better with time. Just gotta keep it moving but boy was that challenging to do. Moving the left leg was painful but getting it up onto the pedal continued to be agonizingly difficult. I realized if I used my spare packing strap to sort of lasso my foot I could then lift my leg up onto the pedal. I tied a loop in one end of the strap and lowered it to my foot, shuffled my foot through the loop and lifted the tag end of the strap with my hand. A sort of dog leash and collar for my foot. So from there on out, when no one was looking I'd cowboy my left leg back aboard my titanium pony. Not sure why I didn't want anyone to know my leg was feeling terrible. Probably cause it would have made it real. If I didn't complain out loud it was just some discomfort that could remain internalized. If I said it it would be real. Ignore it, hide it and it would go away. Besides, I thought "there is plenty of time on the Divide to recover from aches and pains and everyone else must be hurting too." Stopping wasn't good. It meant getting that leg going again and trying to keep it going. I tried to reassure myself with a Newtonian lesson, "an object in motion stays in motion with the same speed and direction unless acted upon by an unbalanced force." Guess I must have been wildly unbalanced cause try as I might I couldn't keep that left leg going. I altered my pedal stroke and body position on the bike to relieve as much strain and effort from my left leg as possible. I could barely stand on the pedals. The most comfortable stroke I could find was to mash a big gear at a low cadence predominantly with my right leg. 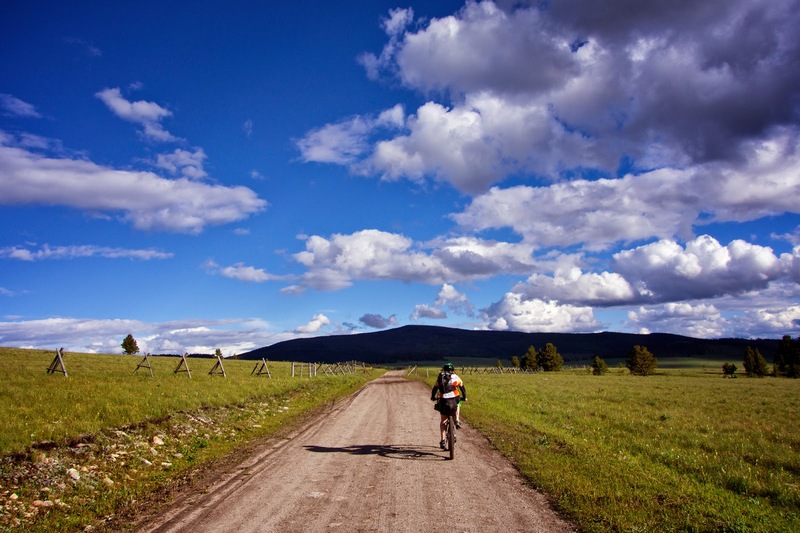 I rode on past Whitefish, Columbia Falls and did not go into Bigfork. My spirits were raised rather quickly on that stretch of pavement when two girls in an SUV pulled alongside me. The passenger looked at me then to her smartphone and back at me again. They sped ahead, pulled into a driveway, jumped out and started cheering my name. Spot stalkers! As I passed by them trying to look cool and strong they cheered my name and lifted their shirts, giving me a bit of a show. As close to being a rock-star as I'll ever get. I heroically pushed on. I rode up into the woods and hills that help form the Swan Valley. It was pouring rain and getting colder. Not that much different from any other part of the race thus far except I felt horrible. As I limped up the road in a deluge of rain eating my dinner, three fried somethings from the gas station many miles ago, I looked desperately for a place to bivy. Too far from any habitation I settled on the less wet ground at the trunk of a large cedar tree up off the road. Bivy and sleeping bag out I crawled in for a damp, cold night. I layed under that dripping tree thinking that the leg should feel better by morning. I downed a few ibuprofen and chased it with a couple pieces of fried chicken. Waking the next morning to the distinct hooping, hollering and whistling of one of the TD racers down on the road going through bear country alone my eyes focused on the world around. Yup, bike still here, yup, still raining, yup, still hungry and still wet. Aha! Half a piece of that fried chicken still on my chest after passing out the night before. Yum! Uhh... Bear!!! Looking unafraid and macho while trying to quickly jump out of a wet bivy sack is pretty much impossible. The bear peered at me as if I was a cachechtic squirrel and moseyed on down the road. I think he sneered at me as he lumbered away. Eating in bed in bear country, probably not he best idea. 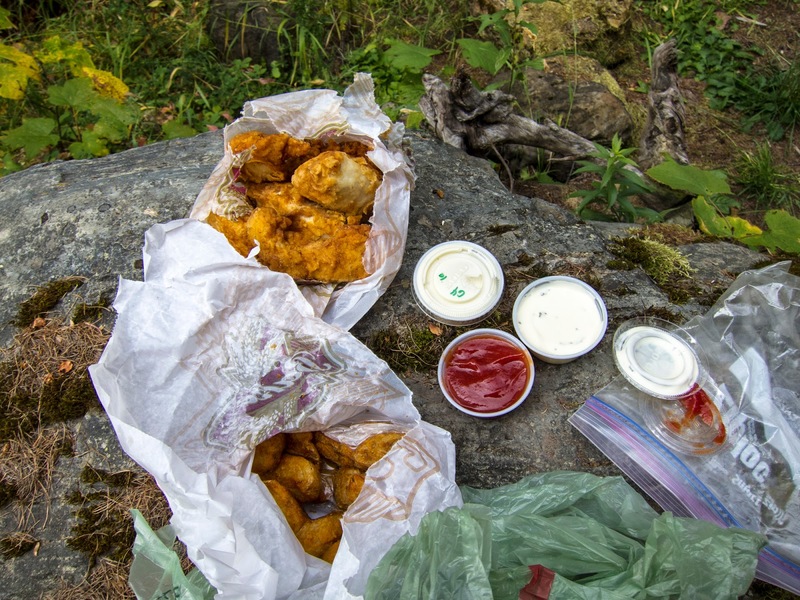 Standing there, bear spray in hand, bivy around my ankles and chicken at my feet I watching him stroll off into the wet forest and wondered if he had taken a bite out of my leg while I was asleep. Man oh man! My left leg sent signals to my brain that jolted and shocked me in ways I thought only a live wire could. I got myself together, ate the dirty chicken, and stumbled back down to the road from my cedar abode. Lassoed the leg and pedaled off into the drizzle. What a beautiful morning that was. Gorgeous red and pink breaks of sunrise light breaking through the clouds over the Swan valley. Complete quiet except my tires flicking small rocks onto my down tube from the muddy road. Rather musical. I quickly met and passed a few riders who had an earlier start than me all the while trying to look "normal" on the pedals. Gotta psych these guys into thinking I'm still strong, I thought. Perhaps it was more for my own psyche. Soon thereafter I caught up to Evan Deutsch again who had left Bigfork early that morning. We rode on together for a while. Chatting and cruising on some slightly downhill sections. I really enjoyed his company. A great guy. Yet all the while I hoped that he would ride on ahead or stop or something. I was in agony and didn't want anyone to see or hear it. Whining on the Divide seems wrong. Everyone is in some form of misery and they sure as heck don't want any part of yours. Keep it to yourself and they'll keep theirs too. We stopped briefly as we ran into Tandem Sam's brother, Peter, again. Turns out he's a pro photographer and had come out to sneak in some TD shots. We chatted with him for a bit while Evan adjusted clothing layers and I lubed my chain a touch. It was time to get going again. I had knelt down beside the bike at the chain. Barely able to stand upright I almost caved again and begged the photographer to give me a ride out of there in his rented car. The draw of the TD made me resist again. I rode on ahead of Evan for a while so I could moan and groan in solitude. On the ascent to Richmond Peak I was passed by Sam and Katie aboard their tandem. How nice that stoker seat appeared to me at that moment. By the time I got to the upper trail portion of Richmond Peak Evan had caught back up to me. It was starting to snow and blow. A spring blizzard was in the works. Evan had raced the year before and I've ridden over that part of the trail twice in previous years on pre-TD race scouting trips. We couldn't find the proper trail. We post-holed through snow. Every step agonizing. Fingers and feet quickly growing numb. Normally in an environment such as this I'd be in my backcountry ski gear. Down, wool, layers of fuzzy fleece, Gore-Tex, substantial mittens, a Thermos of hot tea and heavy boots plus a full backup in my pack. Here, we had on our lycra with lightweight jackets and nearly frozen water bottles. Evan's knee took a beating at one point as he stepped through thin snow and into a buried log. I thought for a moment we might both just curl up and stay there. We finally navigated off that mountain and back to the mini-forest lined road of the route. We walked several hundred more yards through snow till open road lay ahead. By this time the reality of my leg being a hindrance started to really sink in. Evan easily hopped back over his bike and began to pedal away. I had a heck of a time trying to coax my left leg to do anything useful. Evan rode on ahead. I mashed the right pedal with my good leg for all it was worth. Take the strain off the left one and see if it heals I continued to think. Every upstroke of that left leg crushed my spirit. The downstroke wasn't feeling so hot either. 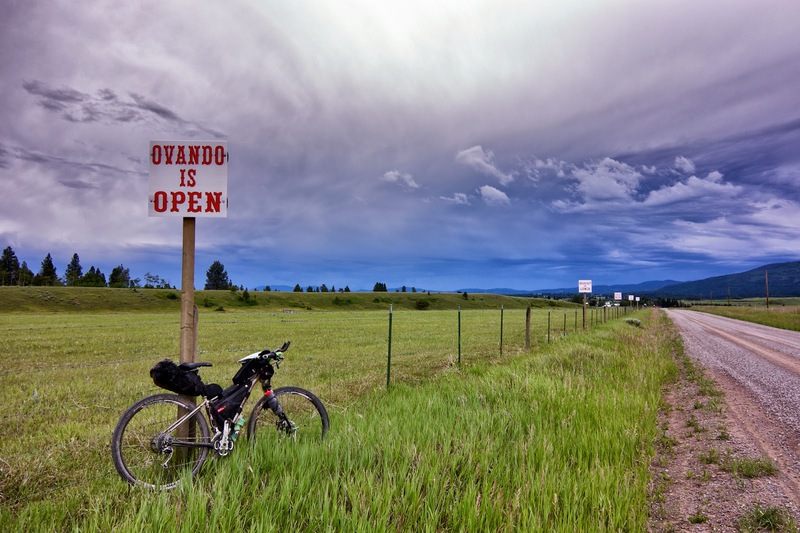 By the time I reached my favorite little bike town of Ovando, Evan and the tandem of Sam and Katie were there with refreshments in hand. Evan wanted to push on to Lincoln. Sam and Katie were moving on too. It was fairly early in the evening. I should go on as well but the little voice of reason in my head started to shout. Miles and miles of altered bike position while trying to mash a big gear with one leg were taking a toll on me. The Achilles tendon of my right leg was swelling and saddle sores that had been started by the Flathead sand in my chamois were exacerbated. I shook Evan's hand and watched as he and the tandem duo of Sam and Katie pedaled off into the rain. I checked into a room at the Blackfoot Trading Post. A dinner at Trixies and a good nights sleep might help I thought. I tried my best at Trixies to comfort myself with comfort food. 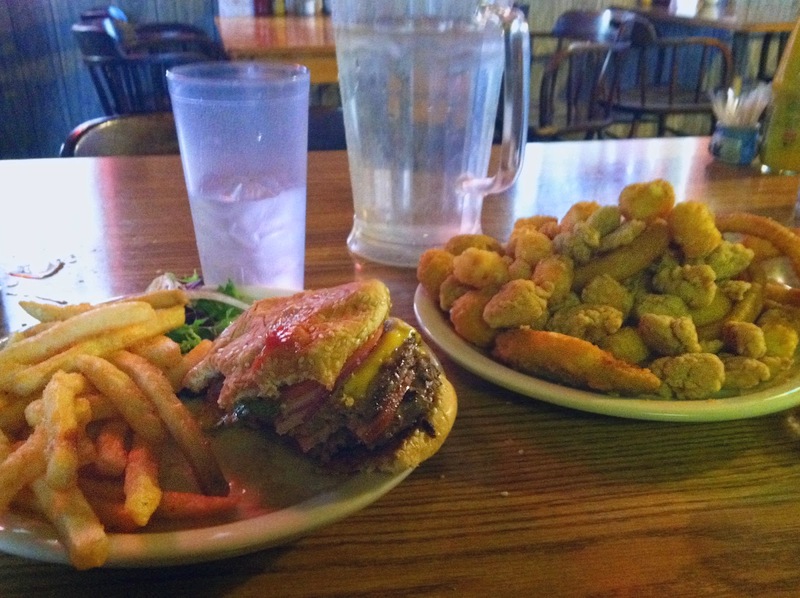 Two double bacon cheeseburgers, a platter of fried shrimp, onion rings, french fries, tater tots, some chicken strips a soda and a piece of cherry pie. It didn't work. When I got back to the hotel and began to strip away the layers of clothing I had been wearing for the past 36 hours or so I noted that the leg warmer on my left leg was sticking to the back of my knee area. As I peeled it away fresh blood followed the stretchy warmer as it descended my leg. I got a look at the back of my leg in the high mirror as best I could. Didn't look good. I soaked in the bathtub while trying to figure out what to do. Keep riding till I can't anymore was the only thought that came to mind. Obviously I wasn't thinking very clearly. I left early in the morning from Ovando. 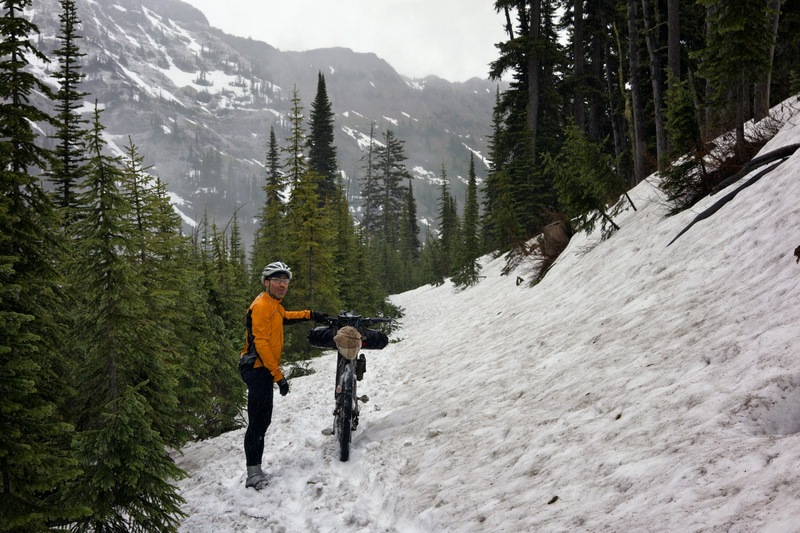 My definition of being cold on a bike was made that day as I rode over Huckleberry Pass. The morning started out not too bad, pouring rain and 33 degrees. By the time I got up the pass it was a full on Montana blizzard and 23 degrees. I had every stitch of my gear on. Including my down jacket which I never use while on the bike. I was still cold. Unable to muster much body heat uphill due to lack of leg strength and being soaked inside and out the temperature felt even colder. Wet, cold and alone... Just another day on the TD. Wet or cold are no problem. Combine the two in extreme forms and it's like chipping away the ice on a pond in the dead of winter to take a swim for 50 miles. Pulling into Lincoln, near hypothermia, I aimed for the Three Bears Motel. I don't think it was even noon yet. Ovando to Lincoln... Not far at all. Barely a warm up on the TD. I sat in the hotel warming myself and drying gear. The sun broke for a bit and I saw a racer or two pass by on the route from my room. I closed the curtains and fell asleep for a while. It was still daylight when I woke up. Limping down to the Wheel Inn tavern I bellied up to the bar and ordered the biggest globs of greasy spoon I could muster. Plus, a beer. I didn't leave Lincoln till early the next morning. I didn't check my positioning on the Trackleaders website. I was in a race with only myself at this point. I figured this was as fast as I could now go. The ride out of Lincoln was wet, cold and windy. Same as all the days before but again with my newly added ingredient of feeling horrible. On the descent from one of the Divide crossings that day I had coaxed my left leg into following along with my right and mashed a pretty heavy gear and got moving pretty well for a bit. Gravity also helped. I deduced that a cadence of 90 meant twice the pain of a cadence of 45 so I pedaled at a cadence of around 30. I was munching on some cheese sticks when I rounded a corner and there in front of me was a rather large hairy fellow. I came to a skidding halt, nearly loosing control of the loaded bike. He stood up tall and proud and looked me in the eyes. My numb fingers fumbled for my bear spray. The bear lowered to all four and started walking towards me. Grizzly!!! I've seen grizzly in the outdoors before. Usually when I'm near or in my truck/camper and have two cans of bear spray, a clear head and a clean pair of shorts. Standing in front of a grizzly, exhausted, half asleep with not much more than a thin Gore-Tex shell between giant bear and body is a sobering experience. Are there any small grizzlies? I raised the can of spray and pointed it directly at the bear realizing that the strong wind blowing from bear to me was likely to be a problem. Spicy seasoned cyclist with cheese on the menu for Mr. Griz. Then I remembered Crazy Larry in Banff. He had given us some crazy bear advice the day before the grand depart. "Talk dirty to the bear", he suggested. I tried to heed his advice, but all I managed to do was croak, "You smell awful!" and drop the cheese stick out of my mouth onto the ground. 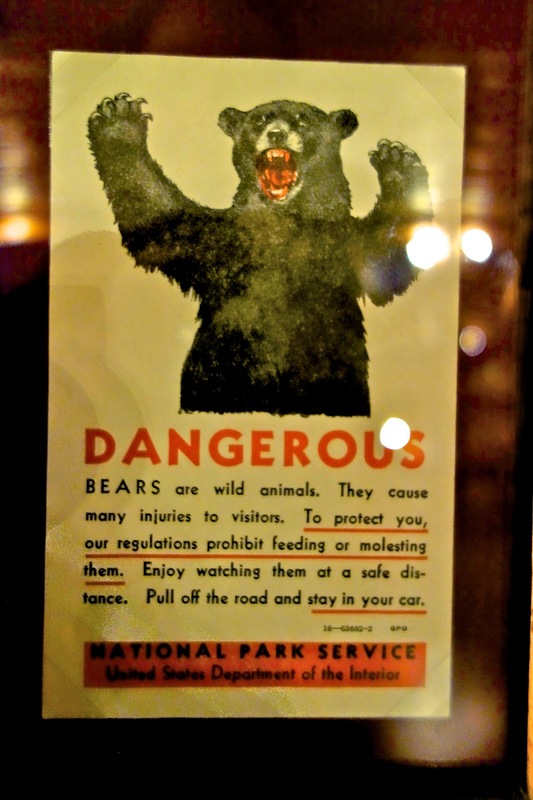 The bear stopped for a moment, the world was in slow motion, then he just meandered off the road and into the forest. 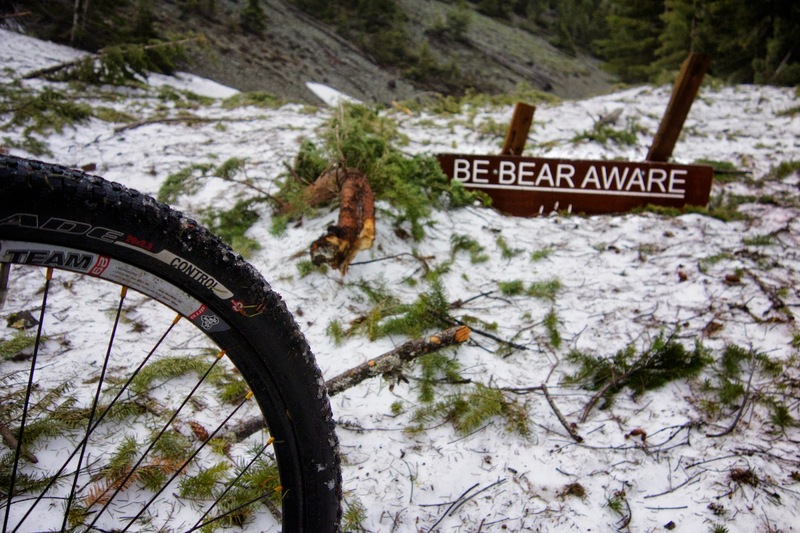 I rapidly stowed the unspent bear spray, picked up the cheese off the ground, ate it and got on the pedals. But I still could not go. This time it wasn't my leg causing me to stop it was a flat rear tire. I had skidded so hard to stop before hitting the bear a rock had torn through my tire. 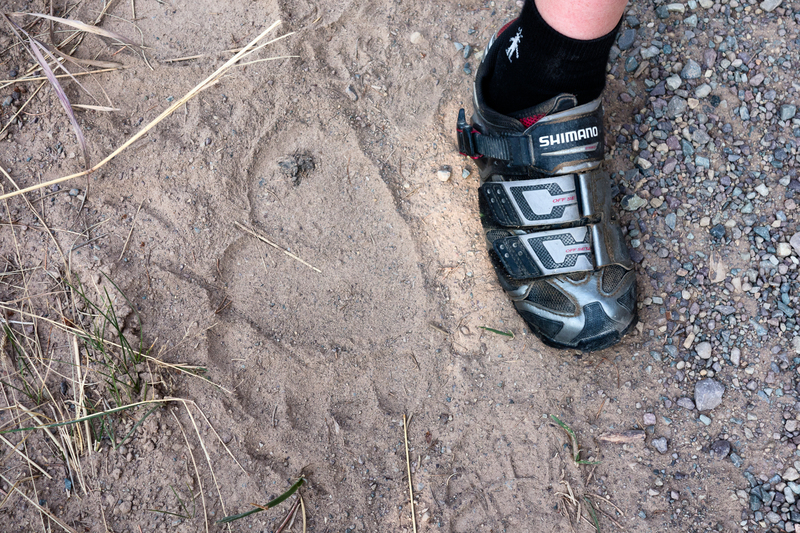 Flat tire, lame leg, big grizzly nearby. Not an ideal situation, but I managed to fix the flat with the speed of a Tour de France mechanic and get out of there. I hadn't seen another rider all day except for north bound Lindsay Shepard. She was powering into a heinous uphill headwind on Highway 12 while I was cruising downhill with a tailwind. She let out a far more enthusiastic holler than I thought any rider in her place would allow themselves. I rolled into Helena and pulled into the on-route Hardees. Another TD bike rested outside the building. As I lumbered into the fine dining establishment Beyonce's "All The Single Ladies" blared over the radio. Torture! My wife had maliciously placed this song in the TD playlist of my iPod before departing Banff. It was on a playlist entitled, "Songs to Give You Pep." For some reason, every time I'd turn on my iPod that song would shuffle to the top and pound into my ears. A cruel joke. I set upon quickly eating 3 double something or others with cheese and fries and a large liquid sugar bomb. Another rider was also fueling up there, Max Morris. He was the only southbound rider I saw that day. I left the fast-food establishment and went to the Holiday gas station where I honed in on the fried goods cabinet to stock up on trail snacks. The slog out of Helena is sort of a blur to me. I remember Max passing me at some point as I changed layers of clothing and I remember working my way up, over and down a very muddy, wet and cold Lava Mountain. Lava is supposed to be hot right? Mostly I remember the argument in my head. Go on and see what happens? Stop and recover? Push on at all costs? I pushed as hard as I could that day and well into the night. I thought that pushing into my physical and pain limits would somehow work out my wounded leg. Besides, that's one of the reasons I was out here right? To see what I was made of. 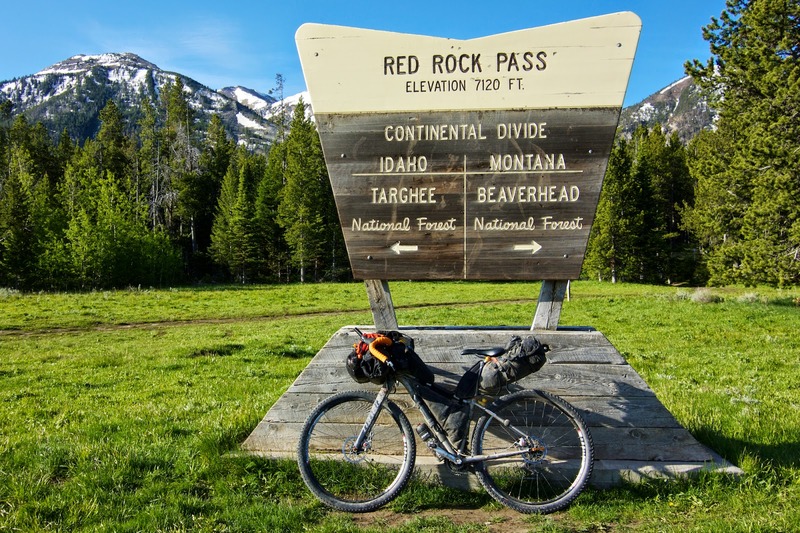 2014 was the first year we would see the Tour Divide route not going down the Interstate 15 from Basin to Butte. Instead some sadistic fellow found a much prettier way into Butte via gravel. I'm sure it would be nice ridden in daylight on a dry day. My bar mounted light and helmet light illuminating a remote road in the pouring night rain. I could make out Max's 2 inch deep tire rut in the muddy road ahead of me. The mud sapped every ounce of energy on every pedal stroke. No coasting at any point was possible. It was well after 10pm, dark, wet, cold and I was in complete isolation. Just another day on the TD. At one point I was enjoying the last of my gummy bear supplies and lost control of the bike in the mud. A slow speed tip-over. Not painful at all. Relaxing actually. I layed there in the mud, in the middle of that road, my helmet light pointing straight up, illuminating the pouring rain, turning it into gorgeous streaks of silver that fell on my face. It seemed to create a warm, watery cocoon around me. I was completely at peace. Not a sound except the rain. I closed my eyes for a moment and seriously considered falling asleep there. I turned my head away from the sky so I wouldn't drown in the pouring rain. I opened my eyes, the helmet light shone upon a tiny, muddied, translucent green object with a face. My last gummy bear layed in the road next to me starring back. I ate it and then slithered out of the mud and rode on into the silver-streaked darkness. I rolled into Butte sometime after midnight, I think. Made my way to the Days Inn hotel, microwaved fried bits of something that had taken up residence in the bottom of my pack, drew a bath in my room, made a call-in to MTB Cast and passed out in the tub. After awakening in a tepid bath I realized I had not even set an alarm. It was late! 9am. The Outdoorsman bike shop attached to the Days Inn didn't open till 10. Being almost unable to extract myself from the bathtub I decided I'd chill out again, take my time, visit the shop for some new brake pads and chain then get a move on again. While getting the requisite parts for my bike the single speeder Dan Hensley pulled in to have some work done as well. The mechanic at the shop got the drivetrain sorta clean and then noticed the rubber duck attached to my bikes seatstay bridge. Not sure why I put that little fellow on my bike before leaving Banff. Some levity in times of need I suppose. He cleaned that duck as if it was a prize show dog. 5 minutes on the drivetrain, 10 on the duck. I loaded up as Dan was trying to extract the bottom bracket from his bike in the work area of the shop. The gas station across the street provided me with a king's breakfast of 3 pizza pockets, 2 cheese and bean burritos, orange juice, Red Bull, a delicious shepherd's pie and something that the counter attendant identified as fried gizzards. It's amazing how fried food that's been under a warming light for some time takes on its own unique life. Undergoing a complex molecular change with each passing moment. Vintage fried goods. 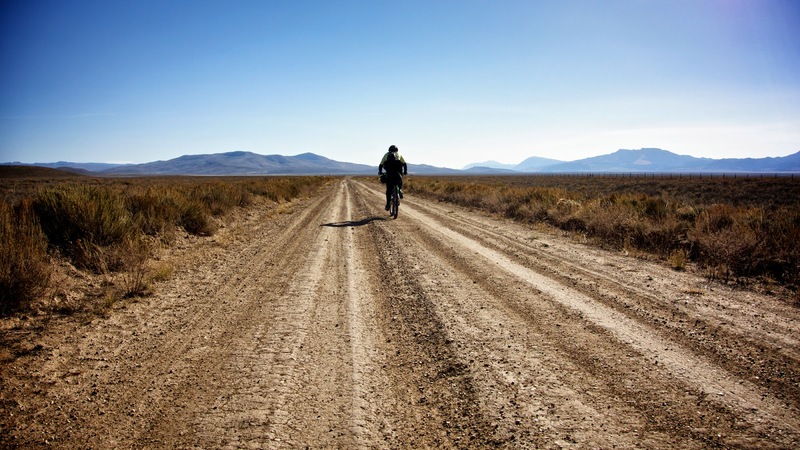 It's not unlike the transformation that occurs to a cyclist on the Divide. A crust forms, bits of the immediate environment are added with each passing second, internal secretions build, come forth and compliment the forming exoskeleton. A type of cryptobiotic crust forms. Soon you have a creation that is almost unrecognizable from that which it arose. A few minutes later I was sitting on the ground alongside the bike path that exits to the south out of Butte, rear wheel in hand. Another flat to the rear tire. After scanning the tube I realized that the spare I had put into the wheel the day before had a small hole. Likely some dried out fried chicken shoved into my frame bag alongside the spare tube had rubbed a thin spot over the days of bouncy riding. Dan, aboard his singlespeed, cruised by, offering his condolences. As I pumped up the tire I realized something was weird. It was sunny! I looked around. There were some clouds in the sky but it was downright sunny. First time since the day before the Divide started. I went about pumping up the tire again, in the sunshine. "Josh!" I looked up. There was Calvin Decker standing over me. I hadn't seen Calvin since the evening of day 2 back in Eureka at the gas station there. It was when he was checking into a room at the attached motel while I was getting some culinary delights. I had left earlier than him that next morning from Eureka, the morning of my crash, thinking all the while he would catch up to me that day. Calvin and I rode through day 1 and 2 as together as any Divide cyclists do. That means seeing each other when one person is going slow and being passed by the other when they are feeling good. Maybe 5-8 times a day you leapfrog one another. Earlier, in those Canada miles I realized Calvin's pace, at that time, was very close to mine. We just rode as we would and throughout the day there was the other on occasion. A fairly even overall tempo. We never worked together and we never were out to kill the other. We were just out there doing what we had each set out to do. We had also split a room in Sparwood, B.C on night one. I enjoyed his brief company. Like myself, he was also a skier. A skier and a biker. An upstanding guy. Dude! Dude! Went the regular greeting of a couple guys. We rode on for a bit after I got my wheel re-mounted. I could tell I was in no shape to match the pace of anyone around me. Especially Calvin's pace. Calvin kept pulling ahead on the slight uphills and would keep gaining ground. I could also see Dan in the distance. Both guys looked like I wanted to feel. Pedaling with both legs, looking good. I felt like a fraud. Barely able to muster any real speed on fairly flat, paved roads. I yelled to Calvin and waved at him as he turned a corner to head up onto the gravel road that would carry us over Divide crossing #5 of the race. I waved because I didn't think I'd see him again and I wanted to wish him speedy and safe travels. I watched as he and Dan cruised up and away out of sight. I was left to my awkward, unbalanced, painful pedalstroke. Nearing Fleecer Ridge I caught up with Max Morris again. He told me about how that night ride from Basin to Butte on the new course, in the rain and mud, had worked him pretty severely. Apparently he found shelter in Butte that night under a tarp outside a Harley Davidson dealership. He was awoken by some Harley dudes. In a twist of trail-magic fate they had seen him asleep out there and cooked him a breakfast before waking him up. Montana hospitality. I was barely able to stand upright while shuffling my feet down Fleecer Ridge. I've been down that slope in the past on a TD scouting trip and it is steep but rideable to good riders with good brakes and a stunted sense of self-preservation. My brakes weren't feeling too robust and I had my fill of falling so decided to walk this bit of the course. Walking downhill wasn't quite as bad as trying to lift my leg onto the pedal and nowhere near as bad as the upstroke. However, I was still barely moving. Behind me I heard brake squeal and tires rolling. I turned, there was Max and his crazy helmet with glued-on blue mohawk and pig eyes ( or were they ears) cruising down Fleecer. At the bottom of Fleecer I heaved my leg back onto the bike. I passed by Max again and cruised into Wise River. Three bikes were outside the cafe. I didn't really want to stop as I knew that would mean trying to get my leg moving again after it had come to rest. However, I recognized two of the bikes as Calvins and Dans. Besides, who was I kidding. I'd be lucky to get up over the pass on the way to Polaris in my state. Some idle chatter with fellow riders and a hot meal would do me good. Milkshake, a huge taco salad (some greens finally) with half a cow worth of ground meat in it and some french fries. We sat there discussing how far to here and there, where in position everyone was and when the next reliable food source would be obtained. No one talked of their ills. I'm sure we were all feeling it but somewhere in the back of my head I kept thinking that these guys are all feeling great and wondering what the heck was wrong with me. If I could just get this leg thing worked out I'd be in it again I kept repeating to myself. As we all rolled out of Wise River on the smooth tarmack I rode alongside Calvin for a bit. He said that if I got to Elkhorn Hot Springs he'd share a room with me to split the cost. The road from Wise River up over Crystal Park and down to Polaris really is a pretty place to me. 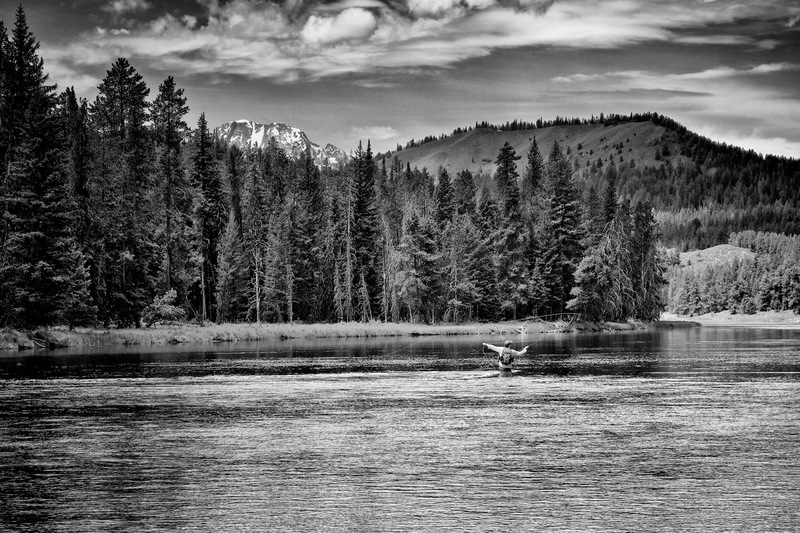 Perhaps it's the river that lazily flows alongside the road and the knowledge that willing trout lay in its waters ready to take a properly presented dry fly or maybe its just the scenery of a mountain canyon. I really enjoyed the ride through there that Valerie and I had done the year before. This day was not so pleasurable. Calvin had zipped up the road ahead and out of sight in our natural style of stronger rider ahead but I knew that this time there wouldn't be any leapfrogging. My left leg was getting steadily worse. Every upstroke of the pedal, no matter how passive I tried to make it was as if someone was shoving a hot dull soup spoon into the back of my knee and trying to carve out a bite, I wished it was a knife, that would have hurt less. The downstroke seemed to hurt too. My shin kind of felt like someone was banging into it with a pointy metal rod every revolution. I was contemplating the merits of nerve blocks when a steady stream of red liquid began to drip onto my handlebar. My nose had erupted into a stream of blood that seemed to match the flow of the river alongside the road. I stopped, slowly dismounted and began to limp up the road, pushing the bike while trying to stem the flow from my nose. A big dually truck came down the road towards me. 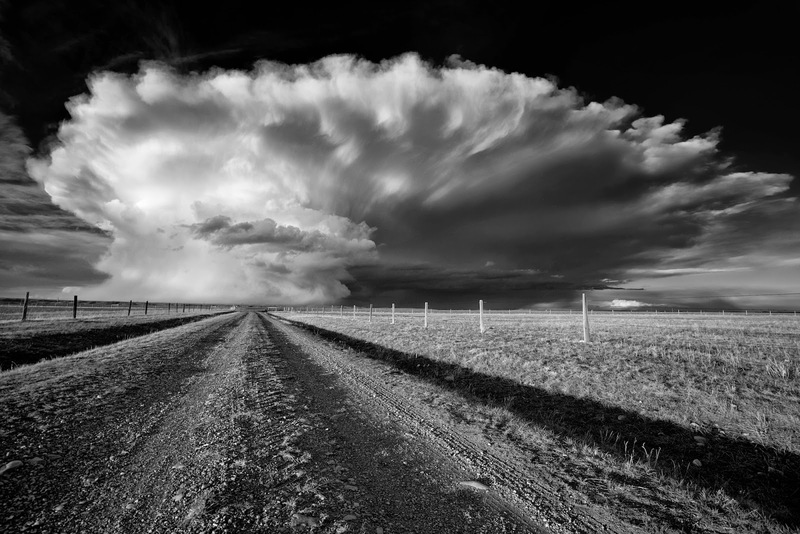 As it approached it slowed and then stopped completely as it came alongside me. The cowboy hat laden fellow jumped out of his truck and frantically asked if I was alright. I must have looked a mess. Blood covering my face and mixed with the mud crusted on my jersey. My hands were a bloody mess too. There aren't any tissue boxes on the Divide. He asked if I had wrecked and needed a ride to a hospital. 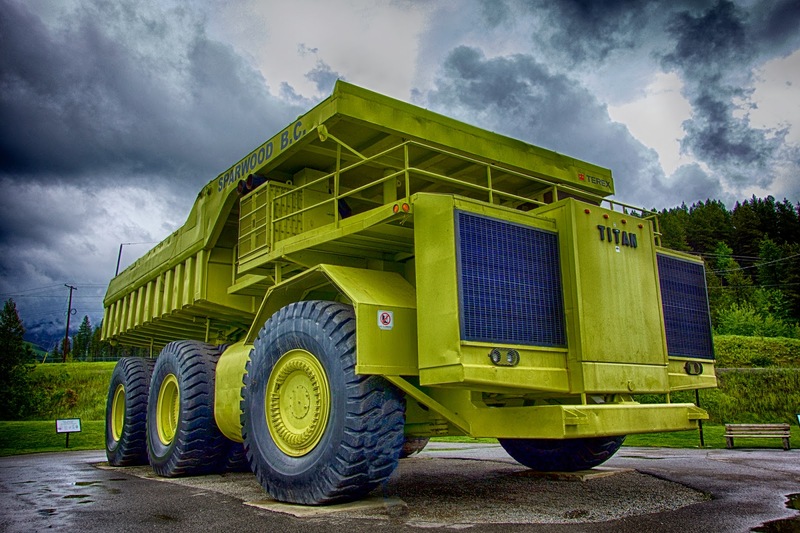 I paused for a moment, looked into the comfy, cushy seats in the quad cab of his truck then shuffled on bleeding. I responded, "I'll be fine, I wrecked a few hundred miles ago, but I'm still going. Thank you, sir." I was going slow up the road to Crystal Park. Crystal Park is a lovely place between Wise River and Polaris. A high mountain grotto that any normal person can drive to. 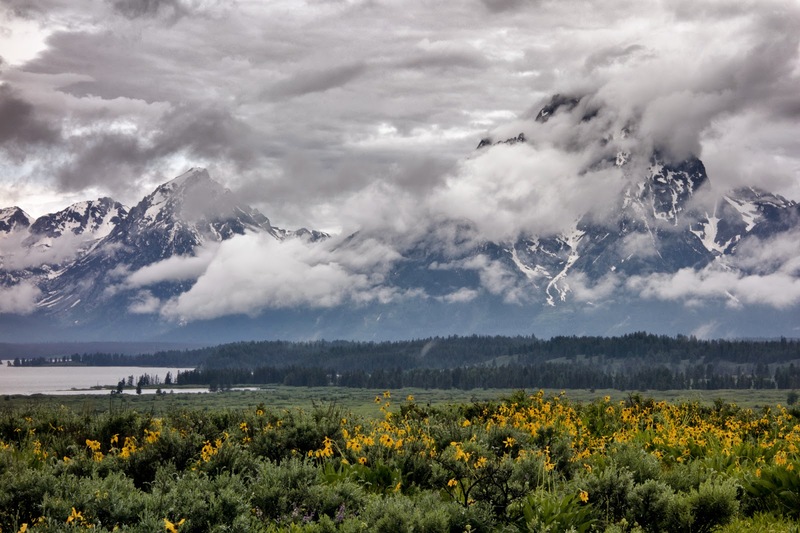 Jutting, snow covered peaks, beautiful, lazy creeks and subalpine meadows are the theme. There was a cold, pleasant solitude. A lone antelope stared at me across a field. He just stared. I know better but I began to think this herbivore might view me as prey. A defenseless, wounded animal. I cruised downhill in the disappearing light. I barely saw the sign marking the turn to Elkhorn Hot Springs in the twilight and almost jackknifed my top-heavy bike making the corner. As I agonizingly pedaled uphill to the rustic old lodge I figured Calvin would be all cozied up in bed with a full belly by now. Walking into the wonderful old lodge I saw Calvin sitting at the bar, burger and fries in hand, crackling fire going in the old stone fireplace behind him. As soon as I walked into the beautifully adorned old lodge the young couple managing the place brought out a plate with a double meat, double bacon, blue cheese burger and a heap of homemade fries. I think Calvin had warned them that a hungry cyclist was on their way. The warmth of the fire behind me radiated to my core. I felt like I was at my granddad's cabin after a great day of fall fishing. We sat, ate and drank. The staff went off to bed and told us to help ourselves to things we might need. Calvin ducked behind the bar and re-appeared with a huge glass jug of orange juice, about 15 gallons in size. It was liquid bliss. We drank our fill. Calvin and I made our way up to a room, I noticed he had a considerably easier time than I negotiating the stairs to the sleeping quarters above the main lodge. "Memory foam mattresses...", Calvin exuberantly exclaimed. We eased into our respective beds and began to chat like old school friends before all important sleep overtook us. Was a good night. The 7th morning of the Divide. My alarm beeped away. We both lay in our beds. Neither wanting to forgo the wonderfully comfortable memory foam nests to go out and brave the cold Montana morning. Eventually we rose out of our beds, Calvin a fair bit quicker than I despite a knee that I could tell was hurting him. My left leg was almost immobile. I hobbled down the stairs to our bikes inside the main lodge. We began to don the appropriate protective gear to endure the cold yet amazingly dry weather outside. Calvin was ready to go. We snapped shots of each other. I told him, "Get going Calvin and go get the guys ahead of us. I probably won't be seeing you anymore from here on out. Keep going strong." I felt empty inside, as if I was sending off a friend to do battle with an opponent whom I knew I couldn't help him with. A battle I was already loosing. 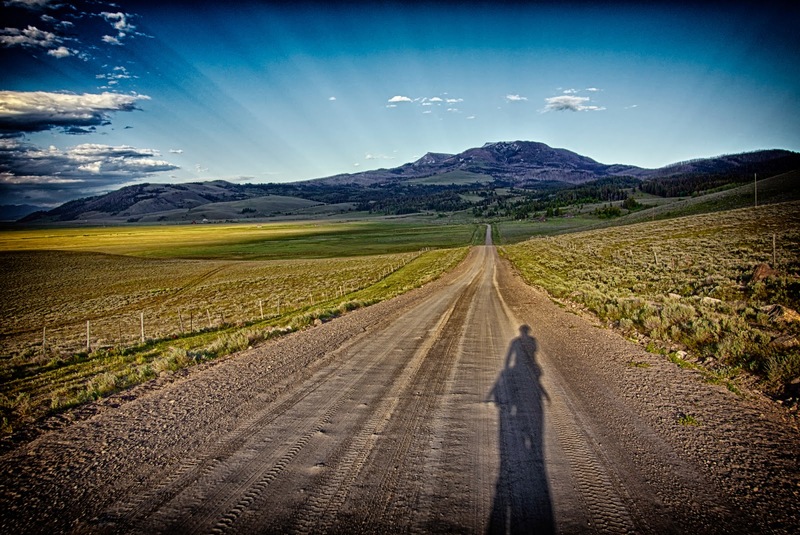 The stretch from Polaris to Lima, over the Bannack Road and Sheep Creek Divide is rather isolated. A contemplative, introspective place. You can see for miles but there isn't much to see in those miles. Just a range of mountains to your side and a never shrinking landscape with a brown track of road through it. I find it beautiful. I've read that the Sheep Creek Divide area is one of the least traveled places that has a road in the lower 48 states. I turned on my iPod. I don't often listen to music on the bike. Preferring instead to just hear the gravel plinging away under my tires. Simple mind, simple pleasures. But I figured the music might help distract me from the constant pain. As the landscape ahead of me unfolded over the handlebar Yo-Yo Ma's version of Bach's Suite for Solo Cello No.1 in G Major: Prelude, resonated through my ears. The landscape appeared brighter, the sky seemed bluer, the mountains taller, more authoritative and the grasses played more happily in the comforting breeze. I stopped the bike and took as much of the world into my soul as would fit. The world felt a bit sweeter at that moment. I pedaled for all I was worth. Break myself or make myself I thought. Not sure exactly what I meant by that but it kept the pedals turning. 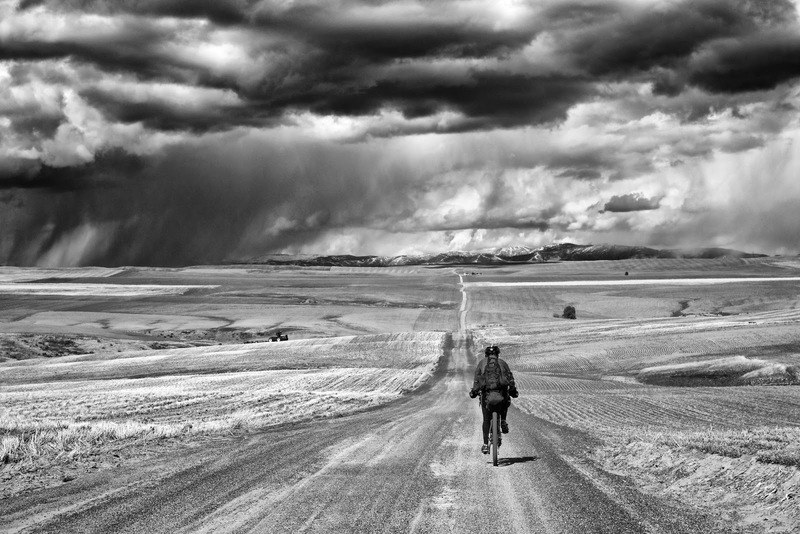 I didn't see a soul from Polaris to Lima except for a solitary rider in the distance changing layers of clothes. Not sure if it was Calvin or someone else. It was a ghost rider I chased through those solitary but completely enjoyable miles. Oh and of course the Jesus Bus! The crazy, wheeled abode that was parked off the dirt road as one begins the descent alongside Big Sheep Creek on the way back into "civilization" near Lima. 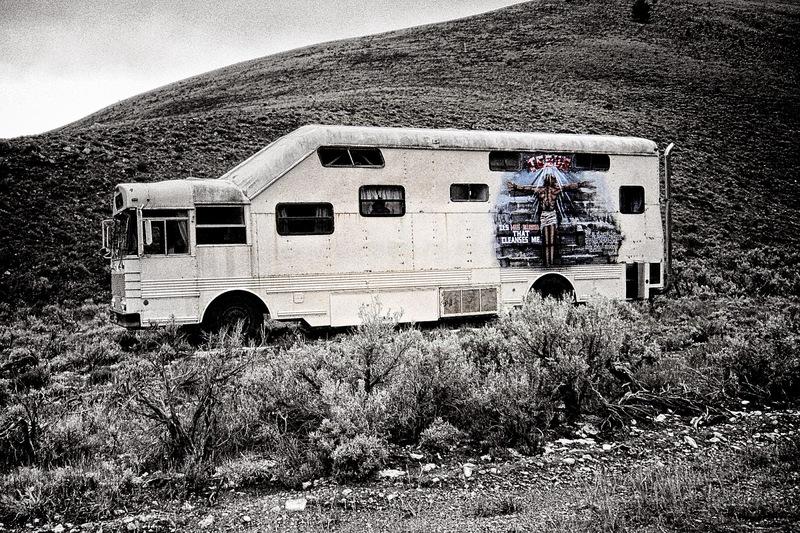 I didn't actually see the habitats of that bus which prominently featured a giant painting of Jesus on its side with the words, "It's His Blood That Cleanses Me" carefully scribed alongside. It was kind of ominous and apocalyptic. Rolling into Jan's Cafe in Lima I noticed Calvin's bike outside. I walked inside to find him finishing up a meal. Obviously his knee wasn't feeling that great but he was bound and determined to make up some time and get on to Island Park. About 200 miles from our origin of the day. Like me, Calvin had put in a short day on the Divide somewhere near Ovando. He was out to regain his positioning in the race. From the get-go I took Calvin as a guy who was super strong mentally and physically. He was going to make it I thought to myself. We shook hands again and he was gone. Bellying up to the old diner counter I looked back to the grill. A large, tall fellow eyed me. Maybe I should have my bear spray out I thought. He walked towards me, put his hands on the counter and leaned down towards me. "You one of them Divide riders? ", he bellowed. "Uh, yeah", I squeaked. "Well Hell's Bells! You little fellers can eat more than anyone I've ever seen! I'm a going back there and firing up all the grills!" He went behind the half wall into the grill area and fired em' up. I guess that Calvin hadn't looked that hungry or perhaps the cook hadn't noticed him. The cook made me up his special platter of Indian fry bread taco salad (there was some green on that plate somewhere), a creamy milkshake, a double order of chicken strips with fries and apple pie a la mode. I took two double bacon cheese burgers with fries to go. I was out of there and barely back on the bike. It was a slow start out of Lima. Perhaps it was the full belly and not so much the leg. The ride across the Red Rock area takes you into a large, broad valley. 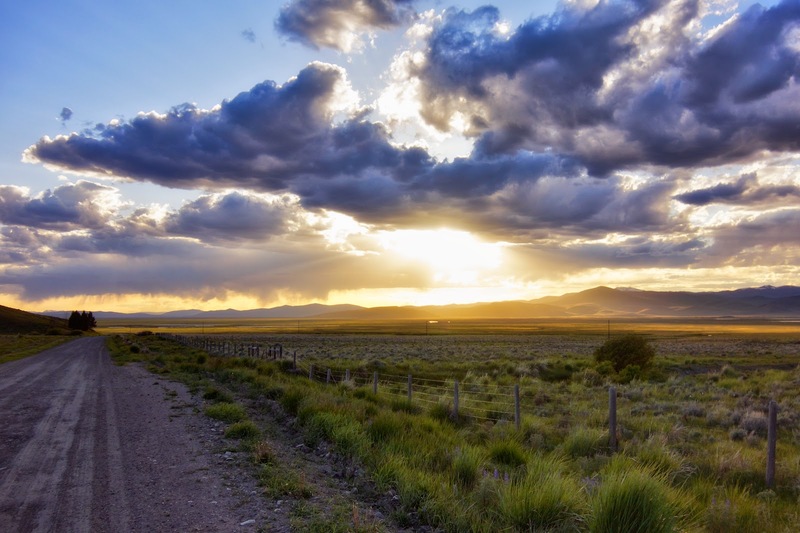 It's quite expansive, similar to the Bannack and Sheep Creek area. The lakes that dot the broad valley add visual appeal and provide a bit of distraction for a mesmerized Divide rider. 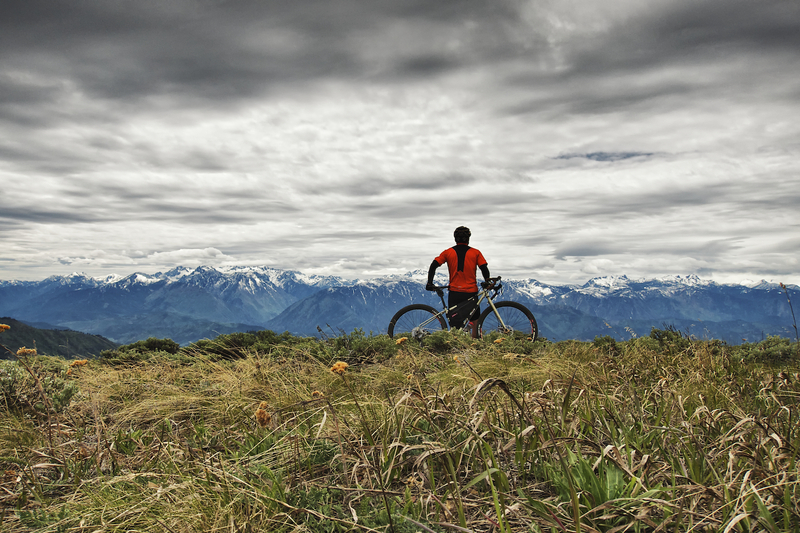 It was to be a day of solitude on the bike. After leaving Lima I would see 1 person walking their dog in the small village of Lakeview. It was a day when battling the wind was a welcome change to enduring the cold rain. It was still dry out. Clouds raced through the broken blue sky pushed over the horizons by the strong winds. I struggled with every pedal stroke to keep momentum over the rocky, rutty, washboarded surface. Several old, dilapidated cemeteries are placed ominously along the road through that area. I considered for some time sleeping in one on the empty cemetery plots that was surrounded by a fence line. I figured the grizzlies would think any being in that fence must be long dead and not worth the trouble. I then considered this was possibly someones reserved postmortem room. I pedaled on. By the time I passed by the designated campground to the east of Lakeview the light was beginning to fade quickly. I don't care so much for campgrounds. They seem crowded in an otherwise open world. I prefer solitary camps where a fellow can be alone but not lonely. I pedaled by. I had been struggling severely for the past few hours to keep my left leg in motion. Bouncing over that rough, rocky road with one leg doing the majority of the work and unable to stand much at all to relieve pressure from my gritty backside was taking a toll on me. 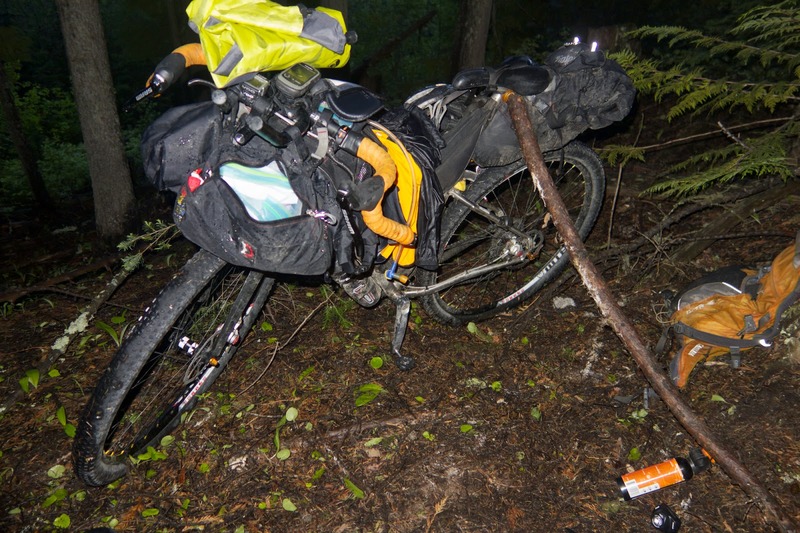 I stopped the bike, turned off my SPOT tracker (something I'd do at least 30 minutes before finding a campsite) and hobbled down the road pushing my bike as I sipped water and ate some chocolate. A large reddish boulder off the road about 40 yards looked like an inviting place to spend the night. I pulled out my sleeping kit, put on my down jacket and hat and cozied in for the night. Shimmying into my sleeping bag and bivy was agony. My leg was rebelling. Out of my pack came one of the two burgers and some of the fries I took away from Jan's Cafe in Lima. An absolutely delicious burger! There is something odd about the sheer simplicity of a great burger. It's almost embarrassing to say but they can be soothing. There I was, eating in bed again. Under a beautiful late evening June sky. Reds and purples illuminated the drifting clouds which were also being reflected on the surface of the distant Upper Red Lake, clouds above and below. Taylor Mountain behind me glowed with authority in the setting suns last efforts. Stars began pushing through the huge expanse of darkening indigo above. I was at peace again. It must have been around 4 am when I awoke. Not so much to actually awaken but because a rather pointy rock had somehow found its way under the low of my back and was now bold enough to let me know. As I tried to readjust my position pains from my leg arose strong enough that falling back asleep was a lost cause. It was cold. A layer of frost cracked away from my bivy as I moved. The stars were just beginning to give way to the colors of sunrise. I reached in my pack for burger-to-go number two from Lima. Day old burger, delicious! I coasted most of the way into the Island Park area. When I had to pedal I had to swear. I could no longer contain the pangs and profanities from within. I was moving between a speed of slow and slower. I pulled into the Robin's Roost gas station/market at the crossing of highway 20. I wobbled through the store and into the back corner where I could see a glass heating cabinet full of fried delights. Sweating tube steaks spun on their metal rollers. Burritos, crispitos, poppers, pockets and strips of the fried variety glistened under the intense heat lamps. I eyed a particular delight on the lower shelf. The tag below it read, "Tornado". "What the heck is a tornado", I mumbled, not meaning to audibly vocalize. Several patrons sitting at their melamine tables eyed me. I scored the last two tornadoes in the case as well as a few grab bags of assorted grease pills, some orange juice, an ice cream bar, two apples and three bananas. As I walked away from the register area a grey haired lady with a name tag, Dalia, got my attention and said, "Son, you are bleeding and your leg looks awful!" She looked me in the eye and paused, "You look awful too." Several more of the patrons eyed me. I limped away. I looked at my reflection in the windows on the way out. I did look a bit flushed I suppose. I realized that when I removed my leg warmer up on the pass before town I must have opened up a wound again on the back of my leg. Guess it had to thaw near the heat lamps of a deli cabinet before it could bleed properly. Outside the store I sat on the curb eating, bleeding and feeling generally ill. The Tornado in its warm plastic bag looked especially satisfying. A good vintage indeed. I poked at it and smelled it. Full bouquet, lovely body. A bite. Balanced, chewy but complex and maintaining a definite superficial crispness. A bit heavy but retaining an earthy elegance. Smooth, toasty, soft and a hint of smokiness. It was as if all deep fried goodness was blasted into a single roll. A tornado! I wouldn't realize till later that evening during nature's call why they are called tornadoes. The rails-to-trails. Much has been said about this horrid little stretch of the Divide. A character builder for sure. I thought my leg was feeling poorly before. Well, that stretch of ATV trodden washboard, bumpy Hell from Island Park to the Warm River was like taking a jackhammer to it. At least a few legendary trout streams tried to take my mind off the task at hand. As I passed the Warm River Campground and made my way up out of the river corridor on the pavement a group of 3 Divide tourers appeared from the shade of a driveway. They rode with me a bit. I had wised they wouldn't have. They were very chatty while I was lost in my own internal dialogue. Again, I masochistically tried to appear happy and fine. When I began to realize that these pleasant fellows wanted to ride with me I paused, told them I needed to sit and eat lunch and that I'd see them later down the road. 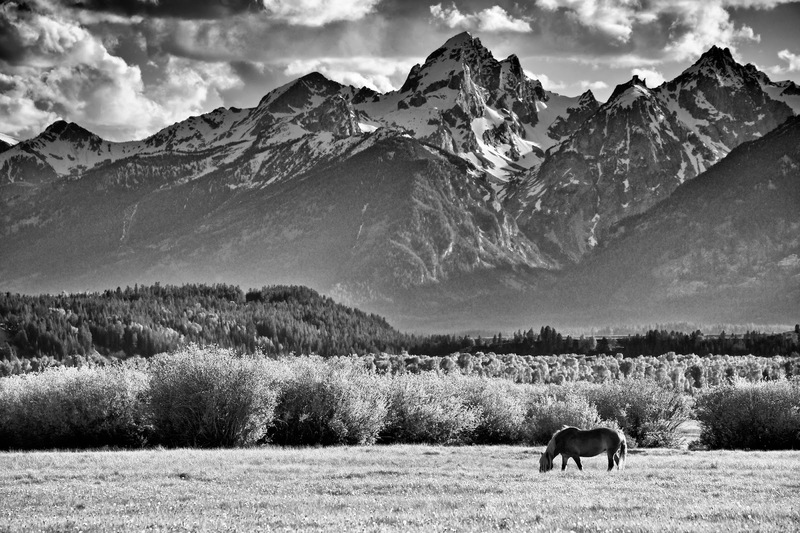 I sat and ate an apple while looking upon the western flanks of the Tetons wishing to trade my bike for my fly rod, flask of whiskey, a handful of ibuprofen and a good truck. I got on the move again when I realized that the mosquitoes were out in force on this day. They must have all hatched out in the first sunny day that June had seen. The dirt road up and over the Grassy Lake Road towards Flagg Ranch was to be the nadir of my Divide. It's not a particularly challenging climb either but it is rutted and rocky in spots with some steep pitches. My new found level of leg pain obtained during the jackhammering on the rails-to-trails section proved to be too much. On steeper pitches I was unable to pedal effectively. The ground was becoming fairly dry and I'd spin slightly, unable to produce any power with my left leg, the weight of a loaded Divide bike proved too much for my useless left and weakening right leg. Nearly every pitch that a regular rider would be able to just stomp the pedals a little harder and go forward saw me on the ground. I'd fall, become a meal-on-wheels for mosquitoes, pick myself up, lasso the left leg, try to go and then just fall again. This was repeated dozens of times over the 10 mile climb of Wood/Grassy Lake road till I reached the descent on the Rockefeller Parkway. By this point the sensation of pain was fully outweighed by the feeling of total defeat. I also felt sick. Fever-like sick. I glanced at my leg during one of my intimate meetings with the ground. I cursed at it. I also noticed that it was rather reddened in the general vicinity of the knee. A reddish, inflamed tide was washing to the front of my leg. I bounced into the Flagg-Ranch Resort demoralized and rather dirty. I walked into the Headwaters main lodge area and found my way to the Guest Check-Inn desk. I told the fellow there, "I need a room." He looked up at me. I could see horror, disgust and a bit of pity in his eyes. The pity must have won out. He said, "I have one deluxe cabin left." My credit card was already on the counter. I bellied up to the bar in Sheffields Restaurant which is inside the lodge. My lame leg hanging off the high stool as if it wasn't attached anymore. I ordered a Caesar Salad, the Bison & Elk Meatloaf and a gin and tonic. My drink had just come when I heard a voice behind me. It was Singlespeeder Dan Hensley again. He had just rolled in. He sat next to me. We talked quite a bit as the wait for the food was rather long. During our pleasant conversation the talk of dropping out came up. He said, "It'd be horrible to have to drop out of this thing now. I've thought about it myself but gee, I'm doing pretty well for a single speeder and I gotta just keep going. Besides, think of everything we've endured." Dan continued, "Anyone that made it to the US boarder as a racer has my full respect already!" We inhaled our meals as I contemplated his words far too deeply. He didn't mention the drink in my hand but I'm pretty sure he noticed when I asked for a second. We exited the lodge. He kept talking about pushing on and asking if I wanted to ride with him. We got our gear together. He straddled his bike. I told him to head on and made some lame excuse like I wasn't feeling so good so would be slow and that he should keep on the move. We shook hands, he rode away onto the course. I turned around with my bike and limped across the parking lot towards my cabin. 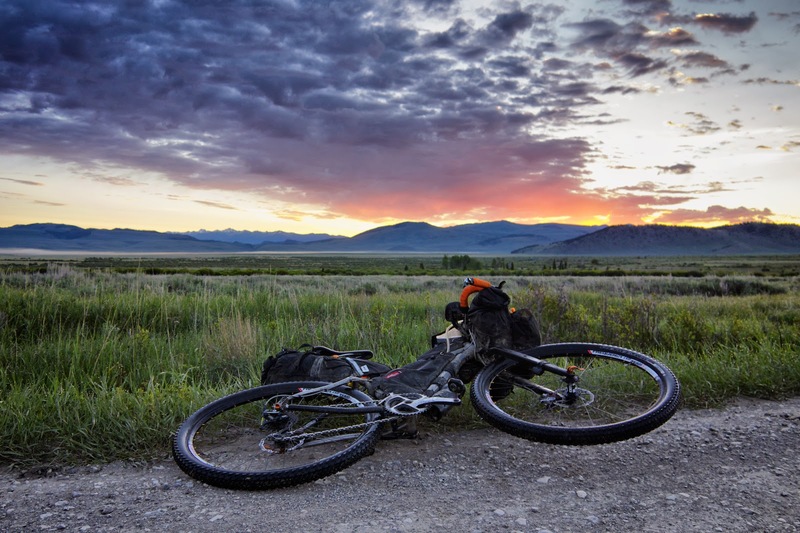 It was the evening of the 9th day on the Tour Divide. I was holed up in a rather luxurious cabin in a National Park. I felt horrid. The bathroom had a full length mirror. I shed my clothes and turned my back to the mirror. Looking over my right shoulder I could see that my left leg didn't look quite right. A large wound had formed behind my swollen knee and there was pretty significant bruising. An angry redness surrounded it all. I suspect that this wound was formed during my crash from something shearing along the back of my leg. The rock, the log or maybe my bike. My leg warmer was not torn, just scoured with mud during that wreck 700ish miles ago back in Montana. I soaked in a hot bath and munched on some gummy bears. The next morning I rode the 20 miles of pavement on the Rockefeller Parkway to Jackson Lake Lodge where I knew a clinic was located. The ride was odd. It was by far the busiest section of road I had been on the whole race. Portly motorhomes swayed down the road one after another. Traffic and people everywhere taking in the spectacle that is a National Park. 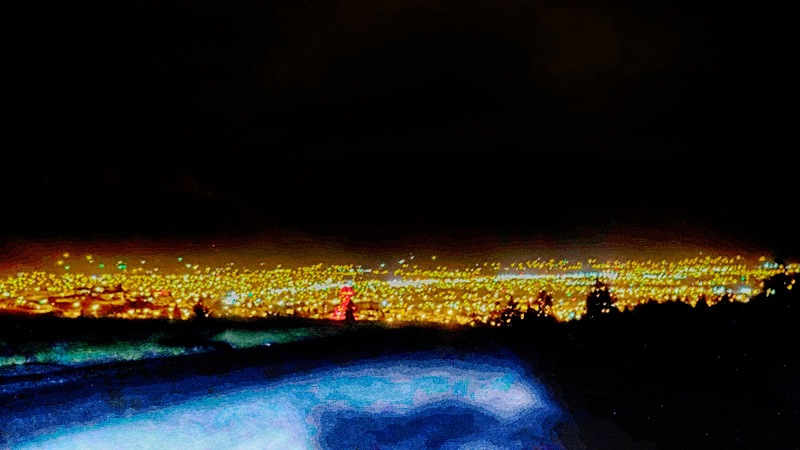 I was used to being mostly alone on the road. Becoming overwhelmed by all the humanity I pulled off the road near a river and hobbled into solitude for a bit. The river drowned out the noisy road. 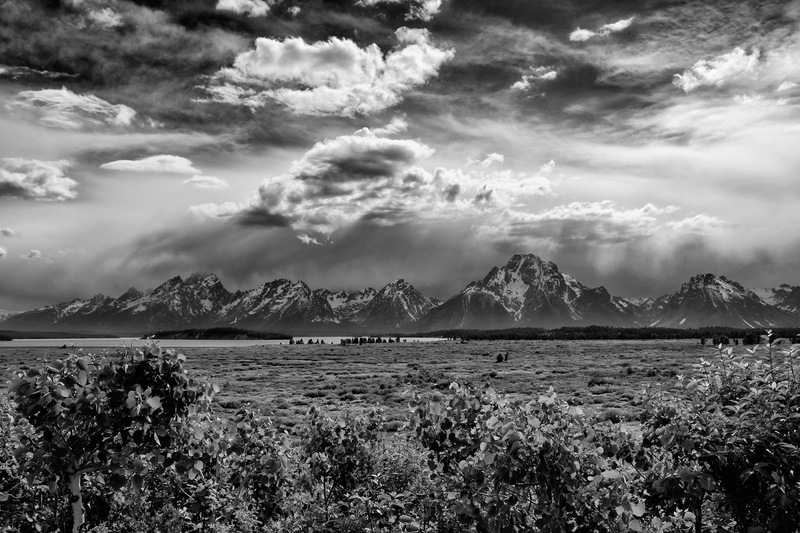 The Tetons loomed large in the distance while I ate a left-over burrito from the previous day. The clinics in the National Parks are pretty small but usually pretty well equipped for their size with X-ray and lab capabilities. 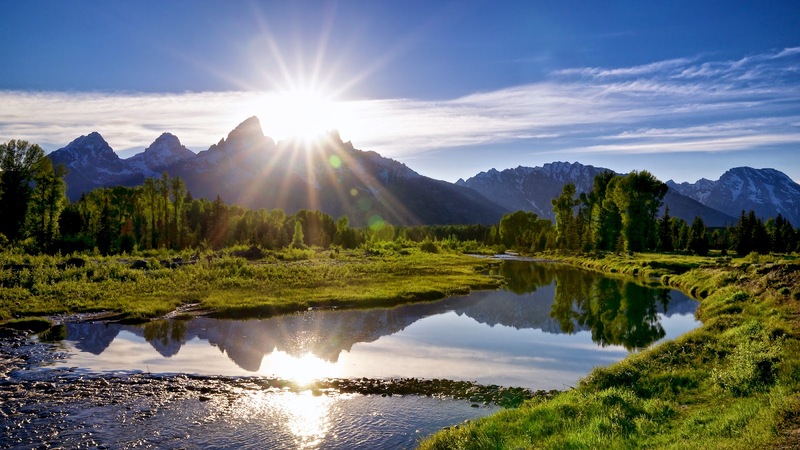 I've used their services in the past and have found that they are usually staffed by some rather experienced personnel that have decided to kick-it in a beautiful place pre-retirement. I tottered into the tiny clinic lobby and checked in. The nurse at the desk was curious as to what had happened to me. She had never heard of the Divide but listened with great interest as I explained how had I had come to be in this place in this condition. I inquired about the orthopedic proficiency of the provider in the back. I was in luck. Apparently the physician assistant working on this day used to work with a sports medicine/orthopedics clinic. I took a seat and waited alongside a 10 year old kid suffering from allergies. He and his mother scooted a few seats farther away when they got scent of me. Sitting on a vinyl examination table in a clinic near Jackson Hole Wyoming I realized why pedaling and shear existence had become so miserable. My ills were as follows. 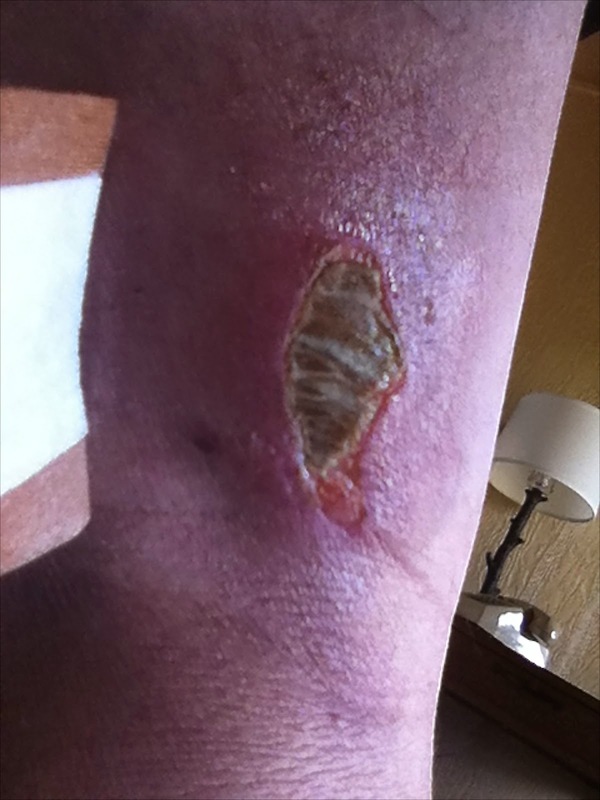 First, an infection to the wound on the back of my leg bad enough to result in a fever. The infection was probably caused by lack of hygiene, exhaustion, poor diet (No way!) and a splinter that stowed away in my leg for 700 miles (A small stick/splinter about 3 inches long was extricated from the wound). Second, a grade 2 hamstring tear. A partial, luckily not complete, tear of the hamstring muscle probably sustained during my aerial acrobatics and dynamic fall with loaded bike. Third, an excessively robust case of saddle sore/irritation initiated by sand in my chamois back in Canada and worsened by an altered pedaling technique/body positioning post crash. Fourth, a great case of achilles tendonitis on the right side. It looked like a goose egg had taken up residence behind my ankle. Last, and likely least, a fractured fibula to the left leg. The physician assistant pondered aloud how it was that he had never seen any other Divide riders in his clinic. The tear of the hamstring was likely the cause of most of my discomfort since day three. It explains why lifting my leg up onto the pedal and the upstroke were so challenging. The fracture of the fibula was why it hurt to push down but that torn hamstring could probably account for most of my agony and inability to apply power. I think that any of the wear and tear and injuries on my body could have been dealt with on their own and I would have continued were it not for that hamstring. Torn muscles and endurance cycling don't mix well. At least not if you want to ride again anytime soon. I got a room at Jackson Lake Lodge. 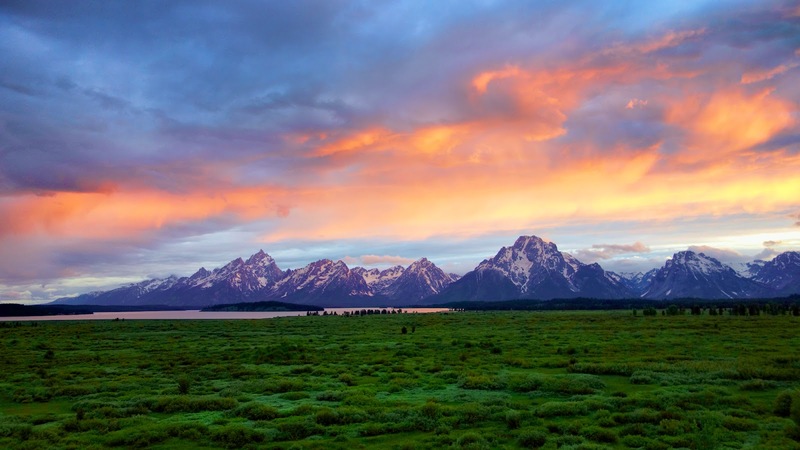 The next day I saw a physician from Jackson Hole who corroborated my menu of injuries. He was also highly amused that he had never heard of nor seen any Divide riders during his time in the area. "There are over a hundred of you morons out there doing this every year and none of them have ever needed my services?" He stated with astonishment. 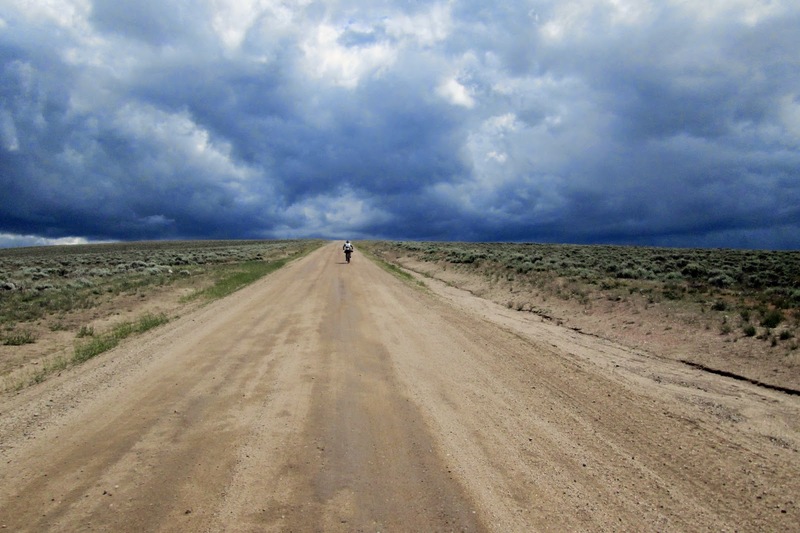 It was June 22, day ten of the 2014 Tour Divide and I was down and out. I knew my race was over but couldn't bring myself to make the final call-in to prove it. My SPOT didn't move at all on the Trackleaders website for a few days. I was still taking up residence at the gorgeous Jackson Lake Lodge on June 25 when one of my best friends, Stein Erickson, from Utah drove up to see me. He surprised me by having with him a full compliment of fly fishing gear, drink and a good truck. 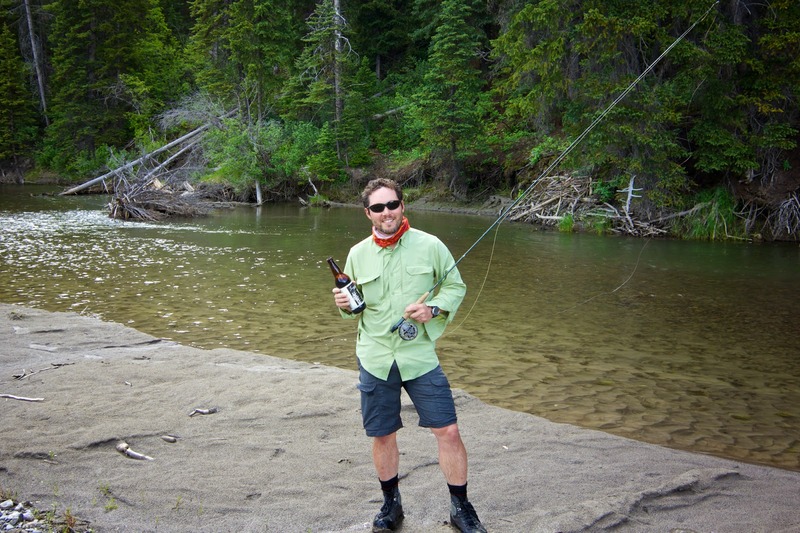 I finally made that last call-in to MTBCast while standing with a good friend alongside a trout stream near Moran Junction with a cold beer in one hand, a fly rod in the other and a smile on my face. 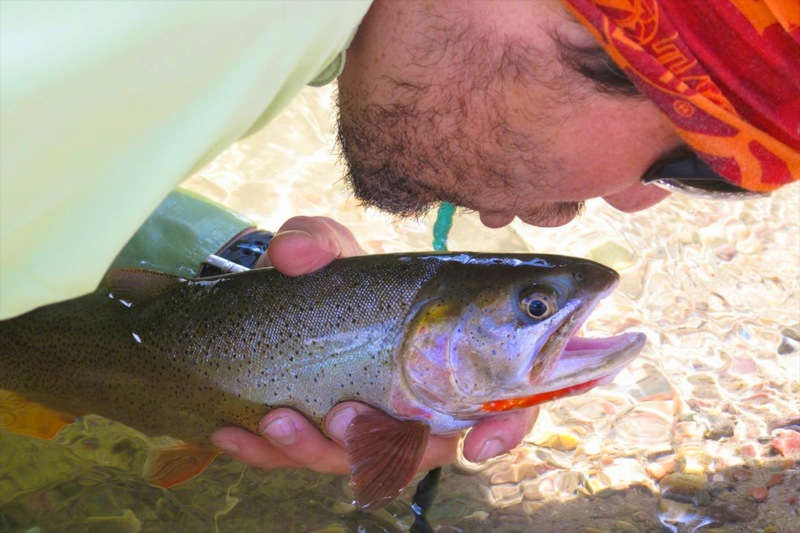 I even caught an exquisite Snake River fine-spotted cutthroat trout on a dry fly that day. By no fisherman's tape measure was it anywhere near one of the largest fish I've ever caught but it is indeed one of the most memorable. My Divide fish. That evening we ate in the Mural Room at Jackson Lake Lodge which has a grand view overlooking the Teton mountain range and Jackson Lake. We had chilled smoked scallops, lobster and brie bisque, heirloom tomato and mozzarella salad, whole roasted black angus beef tenderloin, southwest molasses spiced elk loin, a selection of wine, followed by a flourless dark chocolate cake and some 1996 port. It was a very fine meal and not a bad end to my 2014 Tour Divide. That night I had a dream of heated glass cabinets in gas stations filled with vintage fried goods. It's now January 14, 2015. I've just found out that I have my vacation time granted for June of this year. 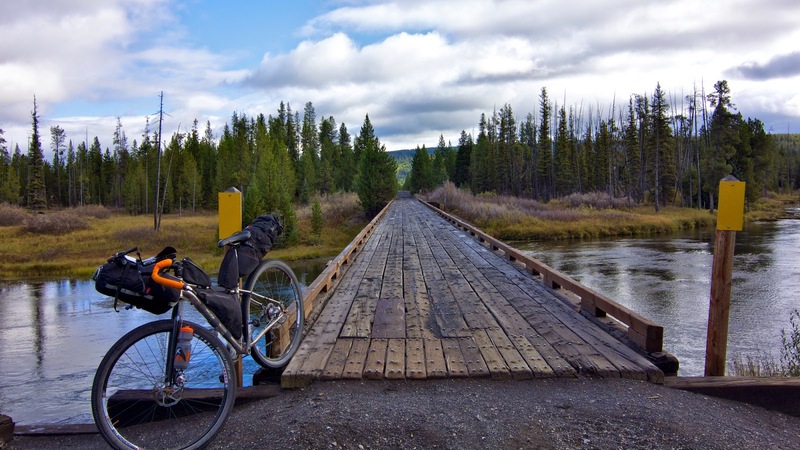 Another Tour Divide start is in the cards for me. I'm nervous all over again! A sense of eagerness mixed with a distinct sense of trepidation. Afterall, recounting how cold and wet it was day after day can't help but trigger some sort of psychosomatic response. I'll be 40 this year. A bit of a birthday present perhaps or maybe an odd mid-life emergency. I still don't know. I'm not really sure why I truly wanted to race last year. I guess I just wanted to go fast. This year I still want to go fast but I feel more like I'm actually looking for something. I'm not sure I'll find what I'm looking for on the Divide. I'm not sure many people do. Maybe it those things we uncover in ourselves that we didn't even know existed. Perhaps finding something unknown is what we look for out there. Perhaps not. I think too much of a racer's time is spent contemplating where to sleep, which way to go and where to obtain the next supply of high caloric artery clogging goodness. There isn't time to contemplate trivial things like life and its meaning or to solve major problems of the world or resolve how to make yourself a better person. Maybe what the Divide is really all about is the simple existence. The surprising peace of laying on your back in the mud while gazing into a rainy night sky, meeting people who seem like lifelong friends, a giant jar of orange juice, a warm fire, comfort food, camping under the stars or the subtle, gradual dynamics of a score of music enhancing a landscape that stretches on and on. It's utterly simple. Just ride your bike from point A to point B, as fast as possible in a solo, self-supported fashion. It really is that simple. I yearn for the simple life again. Best of luck in 2015, were you will once again have the pleasure of enjoying properly aged fried delights…. Great write up and an amazing testament to who you are for sticking it out as long as you did. Hopefully we'll get a chance to say "Hello" to each other in Banff this June. What a great read. Cheers and best of luck with your next attempt. Good luck on 2015! Incredible photos! What camera did you bring with you? Thanks guys. It's gonna be a blast giving it another go this year. Ching, carried a Sony RX100 with me. Excellent writing, Josh! Jenny and I just read through it on the first day of your TD '15. Good luck, awesome young dude! Enjoy the ride this year, Josh!! Chatted w/ Val briefly @ Ephrata Fondo....she mentioned you were giving it another go!! Let those big wheels keep on turnin'!! Cheers! Impressive and amazing!! Beautiful photos!! Good Luck this year, and can't wait to read about it! Dude man. So pulling for you. Keep on grinding. Wow, really enjoyed the story and photos. I've not done the TD yet, but it sounds like it could be the 'closest to being there' blog post I've read so far. I am stoked to see you caught up with the two leaders as you roll on towards Pie Town for the final showdown! Great ride, man! Great riding, great determination. We have been watching for days. Very excited. A Cinderella Story if that can be said about a badass. Wish you smooth rolling the rest of the miles. Pure unadulterated awesomeness. Well done! Looking forward to hearing another play-by-play on this years ride. Huge kudos. A win and course record on take two! OMG. Wow! That was an epic story. Congrats on your win! Way to put the hammer down! Josh, Congrats on a hell of a race. Way to hammer it all the way to the finish! It was cool to be able to see it in person. What a story, Josh! What a crazy adventure. I can't believe you rode that far with those injuries. 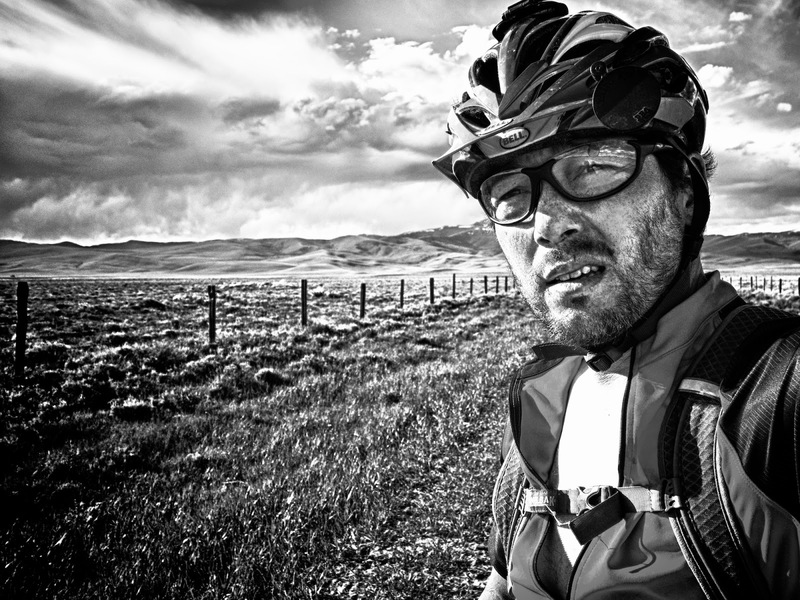 Congratulations on your Tour Divide 2015 victory. Beating JayP at his game is extremely impressive. I hope you had fun too! Congrats! I started reading your 2014 TD post as you were pulling away. No one deserves their name on the record more than you. I'm not even sure setting the record is more of an accomplishment than what you endured in 2014 but I can't wait to read your next post. Your previous year's story is well written and as inspirational. Rest well and enjoy the satisfaction of your legendary finish, Congrats! 2015 TRIUMPH. So deserving. Well done, Josh!